Fantastically located central London apartment with lots of character, 2 min walk from Oxford St and a short walk from Charlotte St and Soho, with their trendy shops, restaurants and bars. Within walking distance of many London attractions. There are three underground stations less than five minutes walk from the apartment. And a late opening supermarket just around the corner. Situated on the second floor of a small purpose built apartment block, this is a two double bedroom apartment, with original fireplaces and wooden floors giving it lots of character. - 2 double bedrooms; one with a king size double bed and large wardrobe, the other with one double bed and a single. - Lounge contains a double sofa bed, flat screen TV, DVD and iPod docking station and dining table and chairs. - Separate kitchen complete with dishwasher, full size fridge freezer, microwave, hob/oven, washing machine/dryer. - Free internet and WiFi. • Tottenham Court road station (100m) 2 min walk. •Goodge St station (180 m) 5 min walk. • Warren St. station (700 m) 8 min walk. • Russell Square (1000 m) 13 min walk. • St Pancras International station (1200 m) 20 min walk. The shower room in this apartment is fairly small but it is modern and clean. Internet is provided by way of WiFi Broadband. It is provided free of charge and intended for medium usage. Central Heating is thermostat controlled. A local swimming pool is located only a short 5 min walk from the apartment. A range of services are available upon request. There is an extra charge for these and include, - A basket of essentials (food or toiletries) can be provided at arrival. - Housekeeping/daily apartment servicing. - local mobile phone sim cards. - Bottled water or alcohol. - Airport transfers. For our first trip to London, I cannot imagine a better location to stay... walk to Oxford Street, British Museum, Chinatown, the tube, grocery store around the corner, restaurants, pubs, even Trafalgar Square. You have it all within a few minutes. The apartment was as described in the listing, just as the pictures show. Even though it is relatively small, they make good use of space and accommodated all seven of us. The London Life Apartments (management group) was great to work with, the arranged transportation for us and were very responsive to every inquiry. There were no surprises. Other posts mention that you can hear everything outside, that is true, but not much happens outside in a small alley... However, be aware that the small alley does attract some activities... and we did notice remnants of drug use around the entrance. It is what it is. That said, we strongly recommend the apartment and would certainly return. Super flat. Great location. Nice guy who checked us in. The location was great. The apartment itself was pretty run-down and excessively hot with no fans. As a result we had to keep the windows open which meant we could hear the vagrants who live on the. doorstep all night long. My husband walked out to run at 0600 in the AM to find them shooting up -- on the doorstep. All night, every night constant noise and talking. Then the hallway from door to landing was being renovated for 4 of the 7 days we stayed there. Pretty disappointed, wi-fi is weak too. The location of the apartment was very convenient, and Roberto and Sean were both very kind and easy to work with. Unfortunately, we had a number of problems which lead me to not recommend this flat. Our meeting time to get the keys to the apartment was changed at the last minute, and I believe Sean sent an email after we had already left on our flight from the States. We took a taxi to the apartment and I had to call him before I found out that we could not actually get into the apartment for several hours. We were able to leave our luggage there, but were left to wander London after a red eye while the flat was cleaned. We were told it would only be a few hours, but it was six hours before the cleaner was finished. Secondly, the WiFi was intermittent. It would work most of the time, but was out for a couple hours each day. Thirdly, the flat directly below us was under construction. We had planned to come back in the middle of each day to put the little ones for a nap, but construction noise made this very unpleasant. The hallway up to the apartment was also in disarray, because of the construction. Of course this is something the managers cannot control, but I feel we should have been informed of this ahead of time. Regarding the noise, we expect a certain amount of street noise when staying in a popular part of the city, but there were yelling and car alarms even in the middle of the night, and twice there were people smoking crack on the stoop next door. The flat itself was fine, and was in reasonable shape, but overall was not what we had imagined it to be. Quirky apartment with a good location on a (sort of) quiet street. Great base for exploring London. I lived in a flat in Central London for a semester a long time ago and used the Tottenham Court tube station everyday, so choosing this flat was a very comfortable decision for me. One thing you can expect about almost any space in London is that layouts are.....creative! All the years of renovations and repurposing create some very unusual floorplans, and that is true here. The flat was just large enough for my family of 5, with my youngest sleeping on the couch. It was great to have a real kitchen in the middle of London, and we took advantage of that. The living space is a bit limited, but WAY better than a tiny, expensive hotel room somewhere! The location is very good, right around the corner from the tube station and a large grocery store. You can walk to the British Museum (free entry!) in 5 minutes or Leicester Square in 15. We walked down to the Strand and Aldgate in 15 mins or so too! Very easy location from which to explore London by foot, bus, or tube. London flats are not known for double-paned windows, and that was true here. Though the street is quiet, every car that went by ran over a manhole cover and made a loud clunk. I am a light sleeper so that made it a bit rough the first night. Didn't hear it the other nights because I was too tired I guess! Giving four stars overall with size and condition of flat. Was not quite as nice as appeared in pics but certainly nice enough. There was work going on in the flat below. The stairs were covered in plastic, and one night we had an overwhelming smell of paint. Doubt future tenants will have this problem. Overall a great value. Much better than renting two hotel rooms in Central London. Just don't expect anything fancy for the price. And I am super fine with that! Hosts were responsive as well. 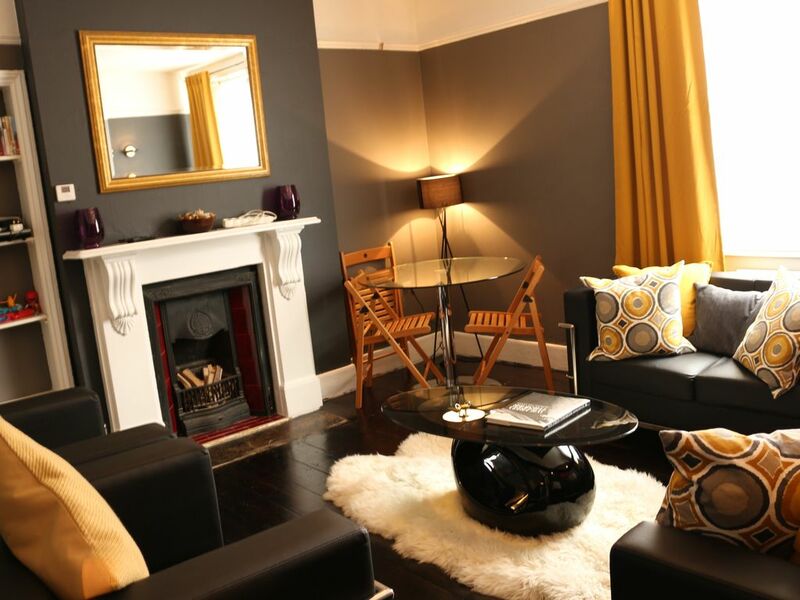 This is a cosy apartment measures around 56 m², is in a period building and located within five minutes walk of Oxford Street, Charlotte Street and Soho. Also within easy walking distance are three underground stations and numerous buses, that will take you directly to many of London’s attractions including; the London Eye, Buckingham Palace, and the British Museum. Trendy Charlotte street is a 2 minute walk and offers a wide choice of bars, restaurants. The best of the shops can be found on Oxford street and Covent Garden. Enjoy a few drinks at a traditional London pub followed by a fish and chip supper or opt for a fantastic meal at the famous Hakkasan or cosy Fino tapas bar. Paddington, Marylebone, Kings Cross, Euston and St Pancras train stations are all nearby, if you would like to travel to the North or West of England OR to Paris/Brussels by Eurostar.